Winter in Moffat County can go from October until April - or even until May, so we've discovered there's nothing that makes a long winter feel shorter than having an activity you enjoy. And there are plenty. We know our business. 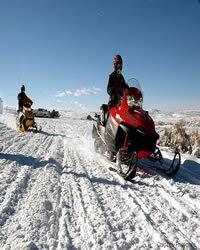 There are approximately 36,500 registered snowmobiles in Colorado. Approximately 80% of snowmobilers use their sleds for recreation. The other 20% use them for work or transportation. In Moffat County, the Northwest Colorado Snowmobile Club grooms 114 miles of trail through Black Mountain and California Park. Trail elevations range from 7,000 feet to over 10,000 feet with snow depths from 4 to 10 feet from late November through April. The area has a wide vriety of terrain and scenery, including steep mountains, stands of spruce, fir and aspen trees and scenic overlook points. At the lower elevations, the trails pass through large open parks and meadows and over gently rolling hills. Contact the Moffat County Visitor Center for a trail map. Did you bring your skiis? If so, you can hit the trails at the Yampa Valley Golf Course, Loudy-Simpson Park or Cedar Mountain. 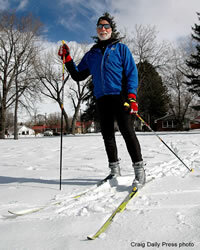 You can also cross country ski and snowshoe anywhere on nearly 2 million acres of public land in Moffat County. Over the past 10 years, ice fishing has grown more popular. The use of portable fishing shelters, electronic fish locators, and new and old bait types have increased angler success. In addition, through its late-fall stocking program, the Colorado Division of Parks and Wildlife (DPW) Hatchery Program has helped to ensure there are plenty of fish to catch. NOTE OF CAUTION: On all lakes, be aware of the ice conditions, especially in those waters below 8000’ in elevation. The freeze-melt-freeze conditions can cause ice to be unstable. It is better to be safe than sorry. Check local contacts for up-to-date ice conditions and please read the additional information regarding being safe on the ice. 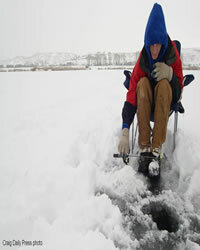 Popular places to ice fish in Moffat County are Elkhead Reservoir and Loudy-Simpson Park.